Nontuberculous mycobacteria (NTM) disease is increasingly common and more prevalent than tuberculosis (TB) in many areas of the world [1, 2]. Treatment is challenging due to the multidrug-resistant nature of these organisms, and the need for prolonged multidrug therapy [2–4]. Linezolid (Zyvox; Pfizer Inc., New York, NY, USA) is approved for the treatment of drug-resistant, gram-positive bacterial infections, and recent studies suggest that linezolid may be useful in the treatment of multidrug-resistant TB [2–4]. 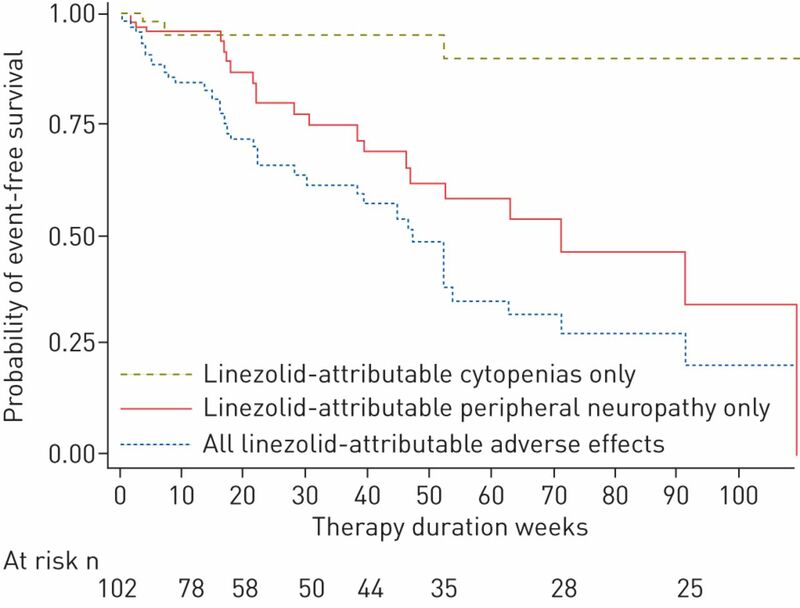 However, linezolid's association with treatment-limiting adverse events, such as cytopenias and neuropathy, complicates its long-term use [3, 5–10]. To our knowledge, no studies have yet evaluated the tolerability of linezolid during therapy for NTM disease [3, 4, 11]. We conducted a retrospective cohort study at six NTM treatment centres in North America and sought to evaluate tolerability of linezolid in NTM patients who were using linezolid prior to January 2013. All of the included patients either met the American Thoracic Society (ATS)/Infectious Diseases Society of America (IDSA) criteria for pulmonary NTM disease or had extrapulmonary disease (defined as positive NTM soft tissue or sterile site culture). Statistical analyses were performed using Stata version 11.0 (Stata, College Station, TX, USA). We identified 102 NTM patients who met the criteria (78% had pulmonary disease). Most were female (73%) and white (80%), with a median age of 58 years (range 3–88 years). Common comorbidities included bronchiectasis (54%), autoimmune disease (23%) and chronic obstructive pulmonary disease (16%). Of the 66 pulmonary patients with radiologic data available, 18 (27%) had cavitary disease and 37 (56%) had nodular disease. Common pathogens included Mycobacterium abscessus (44%), Mycobacterium avium complex (MAC) (33%) and Mycobacterium chelonae (14%). Macrolides (n=81, 80%), aminoglycosides (n=45, 45%) and fluoroquinolones (n=33, 33%) were commonly used concomitantly and 67 (66%) patients received daily vitamin B6 (75% received 50 mg, 12% received <50 mg and 11% received 100 mg). Median linezolid therapy duration after initial drug start was 21.4 weeks (range 1–201 weeks) (79% took 600 mg once daily, 12% took 300 mg once daily and 5% took 600 mg twice daily). After therapy had commenced, 46 (45%) developed adverse events that a clinician attributed to linezolid after a median 19.9 weeks (range 0.1–107 weeks). Peripheral neuropathy developed in 24 (24%) patients in a median of 38 weeks (range 2–233 weeks). Other adverse events attributed to linezolid included gastro-intestinal intolerance (n=9, 9%), anaemia (n=8, 8%) and thrombocytopenia (n=6, 6%). Among those who used vitamin B6 concomitantly, cytopenias and peripheral neuropathy occurred in 8 (12%) and 16 (24%) individuals, respectively, compared with 4 (11%) and 8 (23%) individuals among those not taking vitamin B6. Furthermore, the proportion of patients developing linezolid-attributable adverse events was similar between pulmonary and extrapulmonary disease (47% versus 41%), between those using and not using rifampin (33% versus 48%), and between those with MAC and those with M. abscessus (37% versus 51%). Of the patients with linezolid-attributable adverse events, most (87%) stopped therapy, with treatment discontinuation occurring at a median of 20 weeks (range 1–109 weeks, incidence rate 57.1 per 100 person-years) (fig. 1). Of these 40 patients, 17 (42.5%) later resumed linezolid at either 300 mg once daily (n=6), 600 mg once daily (n=9), 600 mg twice daily (n=1) or an unknown dosage (n=1) for a median duration of 17.3 weeks (range 0.4–95.3 weeks). Kaplan–Meier curve demonstrating the proportion of patients who discontinued linezolid therapy due to an adverse event attributed to linezolid. The proportion of patients who developed linezolid-attributable adverse reactions in this study is similar to that reported during long-term use of linezolid as part of multidrug therapy for multidrug-resistant TB. A case series by Schecter et al. found that the use of 600 mg once daily of linezolid led to lower rates of treatment discontinuation than twice daily dosing, while vitamin B6 was given to mitigate haematological adverse events. In our study, approximately two-thirds of patients received vitamin B6 concomitantly. We used the Chi-squared test to examine the correlation between various patient factors, including the use of vitamin B6 and the occurrence of linezolid-attributable adverse events reported by the treating clinician; we found no difference in the proportion of patients developing cytopenias (12% in users versus 11% in non-users; p=0.9) or peripheral neuropathy (24% in users versus 23% in non-users p=0.9) between vitamin B6 users and non-users. Balancing the risk–benefit ratio of long-term linezolid use requires identification of a dose that effectively achieves clinical benefit with acceptably low toxicity. In our study, most patients used 600 mg once daily dose, making comparison with a lower or higher dose impossible. For drug-resistant TB, some studies suggest that adverse events are more common with a 600-mg daily dosage than lower doses . Similarly, in a systematic review of literature on linezolid-containing regimens used to treat resistant TB performed by Cox and Ford , a trend towards fewer adverse events was described with a linezolid dose of ⩽600 mg daily than higher doses. However, minimum inhibitory concentrations for linezolid with TB are generally lower than for NTM, making it unclear whether once daily dosing or doses <600 mg would provide clinical benefit [12–14]. Further randomised control trials should evaluate the tolerability and efficacy of 600 mg once daily linezolid in NTM disease. The retrospective and nonrandomised nature of our study restricted our ability to draw firm conclusions regarding the tolerability of linezolid in the context of multidrug NTM therapy. In addition, adverse events attributed to linezolid by the treating physician may in fact have been due to other therapies or patient conditions that existed concurrently. Lastly, we were limited in making safety comparisons between different linezolid dosages as the majority of patients in our study used 600 mg once daily dosing. In summary, we have documented that linezolid can be used for long durations in the multidrug therapy of NTM disease. However, adverse events necessitating drug discontinuation are not uncommon, occurring in >40% of patients regardless of concomitant vitamin B6 use. To our knowledge, this is the largest case series published to date to describe the use and tolerability of linezolid in a large number of patients with pulmonary NTM disease. Larger studies are necessary to ascertain the efficacy and long-term tolerability of linezolid, as well as the potential protective effects of concomitant vitamin B6. Support statement: This study was supported by Investigator Initiated Research funding from Pfizer Inc. and in part by the Intramural Research Programme (National Institute of Allergy and Infectious Diseases (NIAID)). Funding information for this article has been deposited with FundRef. Prevalence of nontuberculous mycobacterial lung disease in US medicare beneficiaries. Am J Respir Crit Care Med 2012; 185: 881–886. CDC. Reported tuberculosis in the United States, 2012. Atlanta, US Department of Health and Human Services, 2013. Linezolid in the treatment of multidrug-resistant tuberculosis. Clin Infect Dis 2010; 50: 49–55. A retrospective TBNET assessment of linezolid safety, tolerability and efficacy in multidrug-resistant tuberculosis. Eur Respir J 2009; 34: 387–393. Linezolid to treat extensively drug-resistant TB: retrospective data are confirmed by experimental evidence. Eur Respir J 2013; 42: 288–290.
. Linezolid for the treatment of complicated drug-resistant tuberculosis: a systematic review and meta-analysis. Int J Tuberc Lung Dis 2012; 16: 447–454.
. Linezolid: a review of safety and tolerability. J Infect 2009; 59: Suppl. 1, S59–S74. Good clinical outcomes but high rates of adverse reactions during linezolid therapy for serious infections: a proposed protocol for monitoring therapy in complex patients. Antimicrob Agents Chemother 2006; 50: 1599–1602. Daily 300 mg dose of linezolid for multidrug-resistant and extensively drug-resistant tuberculosis: updated analysis of 51 patients. J Antimicrob Chemother 2012; 67: 1503–1507. de la Bellacasa JP, et al. In vitro effect of three-drug combinations of antituberculous agents against multidrug-resistant mycobacterium tuberculosis isolates. Int J Antimicrob Agents 2013; 41: 278–280. In vitro activity of linezolid, clarithromycin and moxifloxacin against clinical isolates of mycobacterium kansasii. J Antimicrob Chemother 2005; 55: 950–953. Activities of linezolid against rapidly growing mycobacteria. Antimicrob Agents Chemother 2001; 45: 764–767.